I can’t believe it is July already!!! Seriously, we are in the middle of summer? When did that happen? Nonetheless, here we are in the middle of summer and I’m already thinking about fall–mostly because it’s a chance for me to have a second garden. I’ll be starting cabbage, cauliflower, broccoli and broccoli raab inside this month so they will be ready to transplant into my fall garden. There’s still plenty of time to direct sow several things. I plan on planting more carrots, beets, potatoes and turnips. That way, they will be ready just in time for Thanksgiving dinner. I am still looking for Rose of Sharon, Purple Coneflowers, and a few other perennials to hit the discount rack at The Home Depot. I’ve had good luck there this year picking up marked down hydrangeas, candytuft, carnations, tickseed, and salvia plants. This month I’ll actually start to see some of the fruits of my labors. I should have cucumbers, beans, tomatoes, squash, blueberries, herbs and onions ready. If you have an established raspberry patch, you are probably getting tons by now. Make sure to cut some of those flowers you have been growing for vases indoors too. You should be watering your houseplants more regularly now. Stick your finger in the soil, if it is dry up to your cuticle, probably better water. We plan on reseeding the lawn later this month. We will also be ordering another 5 yards of Tagro. I’ll be using some of it to build up my garden beds and the rest to fertilize the lawn. I will also continue working on creating a new flower bed. But first, I need to finish pulling up the sod along the back of the garden boxes and on the hillside. I’d also like to finish staining the fence this month. What is on YOUR chore list for this month? 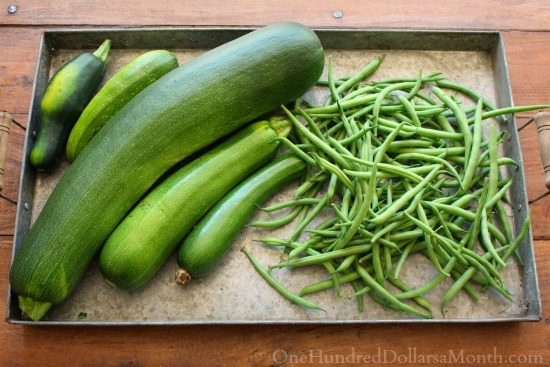 Mavis Garden Blog - Happy National Zucchini Day! Everything is looking so lush!! I love the photo of the butterfly! Hi Mavis! Love your blog! I have been following you a quite awhile now. Question…with it sooooo hot here, when is a good time to seed fall plants? It’s been in the 90’s for quite along time and my garden is in full sun and is at least 5-10 degrees hotter! I’ve had to put up umbrellas to shade part of it! Help! What plant is the one with the greenish gray leave?